Weekend Woman’s Hour this afternoon on BBC Radio 4 on how to cook the perfect steak with Masterchef 2011 champion Tim Anderson. Season the steak with pepper and salt, rub the oil into the steak. The oil is to stop the steak burning. There is no need to add oil to the pan, there is sufficient fat on the steak. It is a myth that oil or fat needs to be added to the pan. It simply burns. One very hot pan, temperature of around 350C. If hand held an inch above the pan it should feel uncomfortable. Fat takes longer to cook than meat, therefore cook on fat side first. Actual cooking time depends on the steak, how long aged, how much fat, how moist, has been in fridge or at room temperature (best from room temperature as cooking more even). A rough guide is one minute each side, plus a minute for each centimetre of thickness. A one inch steak is two minutes for the sides plus 2-3 minutes. Only experience can tell. Flip the steak over every minute. Serve with mashed potates (soaks up the fat and juices), fresh green beans and/or peas or a simple salad. Absolute no is cooking with garlic as destroys flavour of the steak. No sauces for the same reason, you do not wish to distract from the flavour of a perfect steak. Choose quality steak from a good butcher. Jamie Oliver on how to cook the perfect steak. For Jamie Oliver it was Italy, Gordon Ramsay has gone one step further, India. Over 3.5 million curries are dished up in the UK every year. Much as we may think there is such a thing as an Indian meal there is not. What we think of as an Indian meal is what we get in an Indian restaurant. There are exceptions, the little Indian restaurants down a little side street down the side of Euston Station in London, but these little restaurants and what they serve is the exception not the norm. Indians as a general rule do not eat out, at least not eat out in restaurants, they do eat at little roadside snack bars. Food is eaten and cooked at home. There is no such thing as Indian food. What there is is regional food and to discover these regional dishes Gordon Ramsay travelled across India. He very quickly learnt that the real food of India is not to be found in restaurants, it is found on the street and in the home, he also found it bears no resemblance to what he had been served in Indian restaurants in England. 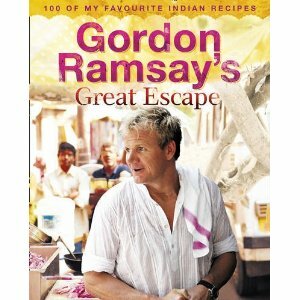 Gordon Ramsay’s Great Escape had a tie-in series on Channel 4, Gordon’s Great Escape. An ideal compliment to The Three Sisters Indian Cookbook. For my lovely friend Sian. Merry Christmas. 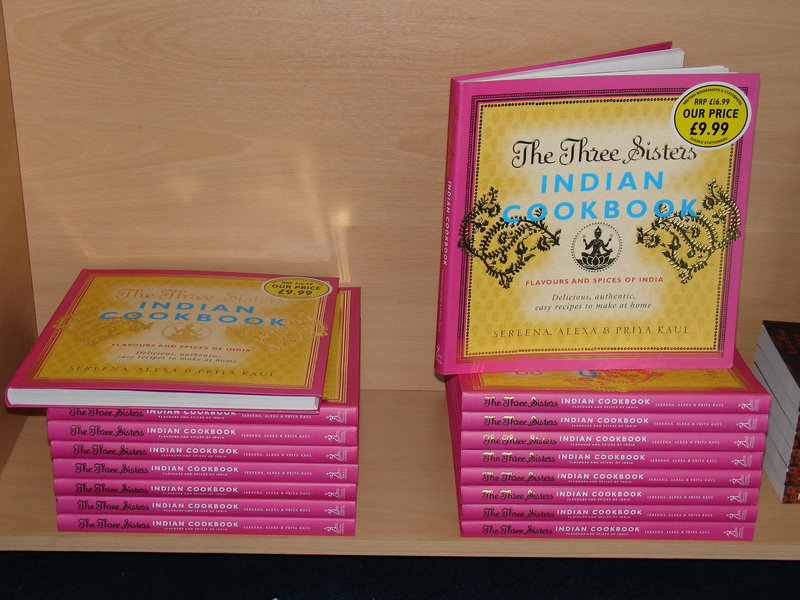 The Three Sisters Indian Cookbook was an event at the Electric Theatre in Guildford, one of the last events of the Guildford Book Festival. It clashed with the Anarchist Bookfair in London, to which I would have liked to have gone, especially as John Pilger was speaking, but I had seen The Three Sisters Indian Cookbook, liked the look, and thought signed copies would make excellent Christmas presents. The previous evening I had been at an Amnesty International event with John Kampfner talking about his book Freedom for Sale. On my way to Guildford I learnt from Mike Dawes and Amy Turk they were at Guildford Oxjam. I would have liked to have seen them but that is another story. I arrived at the Electric Theatre around midday which was quite handy as I met Jenny Lord, author of Purls of Wisdom, a knitting book. She signed a copy for me. Whether it is any good, I am in no position to judge, but some of the ladies present assured me it was. They also made the point that no men were present at her talk! The Three Sisters Indian Cookbook was very poorly attended, maybe three rows in the theatre, which was a pity as the three sisters were very good. The format I do not like, TV chat show host style interviews author. If an author knows their stuff, and if not why are they there, they are more than capable of talking about their book, but it worked this time. The three sisters were born in Kashmir. Their father left to study for a PhD in England when they were very young, then their mother left to join their father, leaving them in the care of their grandmother. Eventually the girls were sent for and went to join their parents in England. For them it was a culture shock. The last time they had seen their mother she was in a sari, now she was in heels and a miniskirt! Their father they did not recognise at all and had to be reassured that it was indeed their father! From a very early age, the three sisters cooked, learning from their mother and grandmother. When they arrived in England, their mother expected the girls to prepare the meals. They were also encouraged to cook, their parents often arranging cooking competitions between the three sisters. The Three Sisters Indian Cookbook came out of a wish to record their mother’s recipes. A little of this and that was not good enough, they needed precise measurements. It was a collaborative effort, the three girls, mother and father. The intended readership was themselves, family and friends. It was a self-published book, sold to those who were interested, hawked around food fairs. It was at one of these food fairs, that Simon and Schuster took an interest. They liked the concept and wished to publish the book. Thus out of what was intended as a project to record family dishes has evolved The Three Sisters Indian Cookbook (Simon and Schuster, 2010). Now scattered across three continents, the project has also given the sisters an excuse to meet up. Now even more important as tragically the nineteen-year-old son of one of the sisters was murdered. We do not refer to European cooking, thus it is meaningless to refer to Indian cooking. The Three Sisters Indian Cookbook is Kashmir cooking. Apart from the big cities that cater for foreigners, Indians do not eat in restaurants, they eat at home or at the roadside. The Three Sisters Indian Cookbook is a book of Kashmir home cooking, the cooking Priya, Sereena and Alexa Kaul grew up with. They are hoping this will be the first of series and they are going to look at the food of other parts of India. Essential to any Indian cook is her spice box, masala dabba. So important is the spice box that the three sisters have created a spice box to accompany their book with thirteen essential spices. Expensive, but if you are serious about Indian cooking then you need it. Indian food you should be able to taste the food. Spices are there to enhance the food, not to mask it. Spices keep for about 18 months. The spice box should be kept in a cool dark place. If they still have a pleasant aroma, then they are usable. If the aroma has gone, then throw them away. A very enjoyable event. My only regret that my lovely friend Sian was not there as she would have loved it too. Top story in Gourmet Chef’s Daily (Monday 7 February 2011). 12 April 1984, a small group of people met and formed the Guild of Food Writers. A cookery book is usually one chef or writer. In this, How the British Fell in Love With Food is unusual, it has contributions from the Guild of Food Writers. From Jane Grigson to Rich Stein and Raymond Blanc to Hugh Fearnley-Whittingstall. Noticeable by his absence is Jamie Oliver. But despite, or maybe because of, a plethora of cookbooks (glossy coffee table cookbooks are never out of the best seller lists), the English cannot cook, they are not in love with food. Cookbooks are to impress. Sadly cooking is seen as a chore, something to spend the minimum amount of time and money on. Contrary to the title, the British have not fallen in love with food, I only wish it were true. A couple of years ago I started an article on how dire was the state of food in Britain. I must revisit it one day. There are though rarities, little oasis in an otherwise food desert. For example The Deli in North Camp. Then there is Brighton where one is spoilt for choice, Taj the greengrocer, Infinity Foods, Iydea. Then the delight I came across at the beginning of the week, Grocer and Grain. How the British Fell in Love With Food is a celebration of 25 years of the Guild of Food Writers. For my lovely friend Sian who likes to try new things. Slice bananas and cook in a hot pan in butter. Use under-ripe bananas as ripe bananas will turn to mush. Sprinkle on a little brown sugar to caramelize. Flame with liquor to seal in flavour. Serve with cream or ice cream. Add a few fresh strawberries or raspberries if in season. Thanks to Peter O’Connor of O’Connor’s Secret Garden Bistro for the dish which he demonstrated at Alton Food Festival. Sliced boiled potatoes (these are more than par boiled but not fully cooked that they are soft), sliced fresh spring greens (must be green not white), sliced scallion, are added to a hot pan and cooked in butter. Serve as the vegetable dish. Ideal to go with Bantry Bay Beef. Thanks to Peter O’Connor of O’Connor’s Secret Garden Bistro for the dish which he demonstrated at the Alton Food Festival. Slice the steak and mushrooms and add to a hot pan to which you have added a drop of olive oil. Sprinkle on rock salt and black pepper for seasoning. Cook until steak is medium rare or to taste. Flame with a shot of whiskey or brandy. This helps to seal in the flavour. Mix wine and about a quarter of a small pot of double cream. Add to the hot pan. Cook until cream has started to thicken. Serve with a sprig of parsley or watercress, tomatoes and colcannon potatoes. Many thanks to Peter O’Connor of O’Connor’s Secret Garden Bistro for this dish which he demonstrated at the Alton Food Festival.